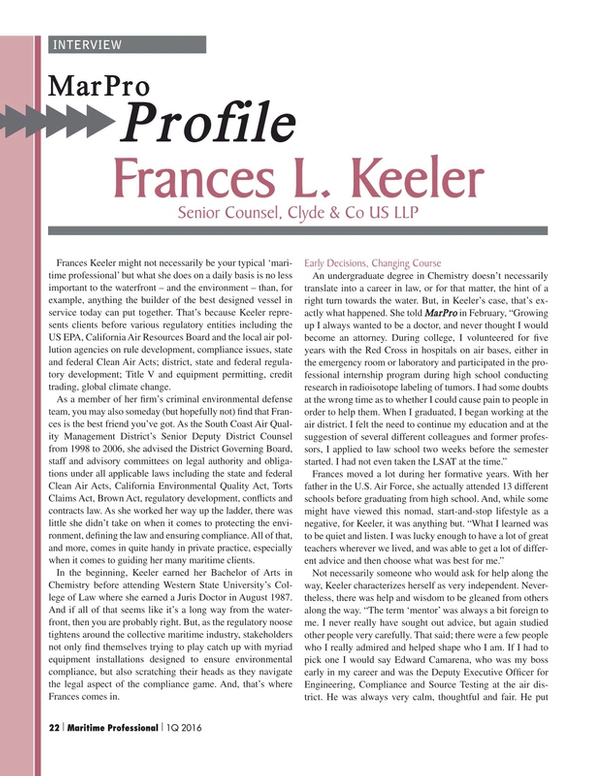 Frances Keeler, Senior Counsel, Clyde & Co US LLP, might not necessarily be your typical ‘maritime professional’ but what she does on a daily basis is no less important to the waterfront – and the environment – than, for example, anything the builder of the best designed vessel in service today can put together. That’s because Keeler represents clients before various regulatory entities including the US EPA, California Air Resources Board and the local air pollution agencies on rule development, compliance issues, state and federal Clean Air Acts; district, state and federal regulatory development; Title V and equipment permitting, credit trading, global climate change. As a member of her firm’s criminal environmental defense team, you may also someday (but hopefully not) find that Frances is the best friend you’ve got. As the South Coast Air Quality Management District’s Senior Deputy District Counsel from 1998 to 2006, she advised the District Governing Board, staff and advisory committees on legal authority and obligations under all applicable laws including the state and federal Clean Air Acts, California Environmental Quality Act, Torts Claims Act, Brown Act, regulatory development, conflicts and contracts law. As she worked her way up the ladder, there was little she didn’t take on when it comes to protecting the environment, defining the law and ensuring compliance. All of that, and more, comes in quite handy in private practice, especially when it comes to guiding her many maritime clients. In the beginning, Keeler earned her Bachelor of Arts in Chemistry before attending Western State University’s College of Law where she earned a Juris Doctor in August 1987. And if all of that seems like it’s a long way from the waterfront, then you are probably right. But, as the regulatory noose tightens around the collective maritime industry, stakeholders not only find themselves trying to play catch up with myriad equipment installations designed to ensure environmental compliance, but also scratching their heads as they navigate the legal aspect of the compliance game. And, that’s where Frances comes in. Beyond that, Keeler is a puzzle-solver. She enjoys helping clients find the best solution to their issues and working with regulators to find an amicable solution. She adds, “While I do litigate and find that sometimes it is the only solution, I don’t necessarily believe that litigation is the best way to resolve an issue.” That might just be music to the ears of today maritime shipping executives. When she’s not solving a thorny environmental issue or defending her clients in court, Frances Keeler somehow finds time to join and actively participate in a raft of maritime, educational, ports and harbors organizations. Among these organizations, she notably serves as President of the Board of FuturePorts, as Secretary/Treasurer of the Board of the Harbor Association of Industry and Commerce; a Board Member of the International Trade Education Program; and is a member of the Propeller Club of Los Angeles-Long Beach.